Ford transferred the Fairlane nameplate to its new "senior compact” line for 1962. 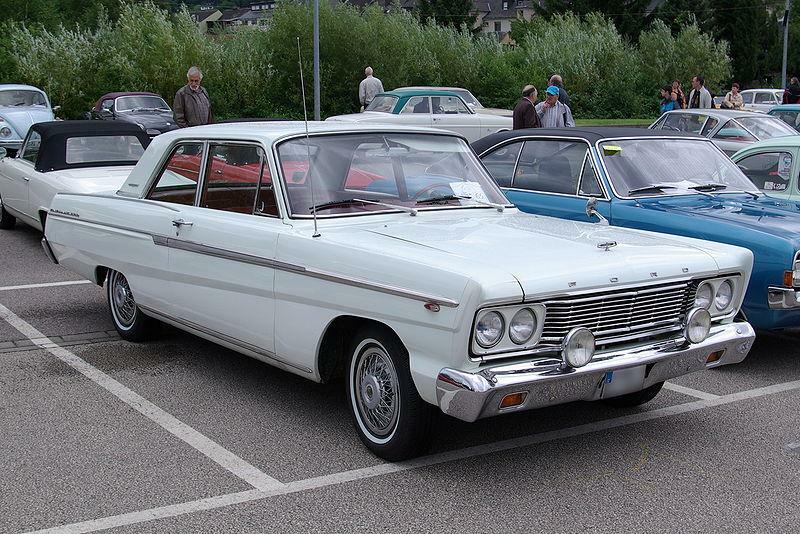 The downsized Fairlane was 11.7" shorter than regular Fords, but 16.5" longer than the Falcon. A Ford six or new 221-cid OHV V8 powered the new cars. The mid-year Fairlane 500 (pillared) Sport Coupe came with buckets and console. A 260-cid V8 and four-speed manual transmission were optional. For 1963, the nicely restyled Fairlane Sport Coupe became a true hardtop. New Fairlane wagons included a faux-wood paneled Squire. Late in 1963, Ford introduced its hot 271-hp 289 V8 in Fairlane. Substantially upgraded styling kept 1964 Fairlanes competitive with Chevy's new Chevelle—and a Ford 427-cid V8 made that year's limited run of Fairlane-based Thunderbolt drag cars more than competitive. A new Fairlane look appeared for 1965, as the car shared heavily sculpted sheetmetal with that year's Mercury Comet. Rectangular tail lamps replaced formerly round units. The pleasingly styled 1962-65 Fairlane 500s are scarce, but generally quite affordable today—Thunderbolts excluded! An authentic Hi-Po V8/4-speed Fairlane can be a super Ford bargain.